Info "Gold! (Don't get eaten by sharks.)" Money Hungry is one of Wario-Man's microgames in WarioWare: D.I.Y. Showcase. To win, the player must swim down to the treasure chest at the bottom of the ocean. 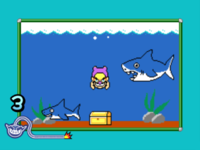 However, there are two sharks in the way; if Wario touches either one, he will get caught in its mouth, and the game will be lost. 1-UP • Apple Thief • Art Practice • Beam Me Out • Bear Afoot • Bird & Beans • Bird Breath • Blob & Key • Blob Blast • Blown Away • Box & Blocks • Boxed Up • Braking News • Bubble Break • Bulb Change • Bun Blitz • Cakesplitter • Cheer Check • Chute, Score • Color-Full • Count 'Em Up • Cowabunga? • Dating 101 • Deflect Beam • Digital Daze • Donut Wholes • Dragon Duel • Eggplant Fog • Eject Reject • Falling Eggs • Fan Boys • Final Battle • Finger Flex • Fish & Game • Flycatcher • Fossil Flop • Fried Shrimp • Fright Light • Gator Bites • Go, Dad! • Goombas • Hare Raising • Hideout • Home Stretch • How Low? • Hue-Down • Jump Jets • Keep Walking • Kickback • Ladies' Man • Laser Aliens • Line Connect • Lost Child • Mario Maze • Masterpiece • Matador-able • Matching Man • Maze Maestro • Memory Blobs • Mountennis • Mouse Hotel • Multi-Fly • My Boyfriend • Pencil Pinch • Penguin Chow • Perform-Ants • Polterball • Power Grill • Ready, Aim • Rhythm Count • Roach Blast • Rock Hard • Rocky Road • Saving Rain • Sheep Hunt • Sink Whole • Sky-Scrape • Sleeper Swat • Snow Fall • Soccer to Me • Sonar Sea • Squid Lunch • Stop Them! • Stop Thief! • Sumo Robots! • Switch Back • Temple Trap • Tennis Pro • The Big Race • Thirsty? • Tissue Trap • Toppings! • Ugly...Bird • Volume Deal • Wario Swarm • Watchful "I" • Water Drop • Weigh of War • Winding Up • Zoo Zounds • ...Surprise! This page was last edited on October 3, 2018, at 21:54.